Sounds like you guys had a great day. We look forward to meeting up with other fulltimers when we get out on the road. Smoked salmon sounds so yummy. Sounds like you all had a great day! We will be heading up the coast in just a few days once we close the pumpkin patch up. We will probably be crossing paths since you are heading to Arizona but the timing may be off. 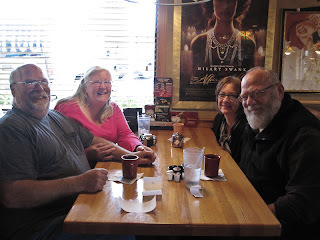 Dave and I had the pleasure of meeting Alice and Ron at our home in Vancouver, WA. We thoroughly enjoyed getting to know this fine couple. I agree with your assessment in your last paragraph--they are hard workers, they are not whiners, and we admire their "can-do" spirit! Great to catch up with you guys again and thanks for the note in your blog. Yes! we still look back at the great day you two showed us in Grand Rapids seeing the Meijer Gardens and Gerald R. Ford Museum! Safe travels as you head south. We won't be in Texas until late February...but it would be wonderful to see you again!